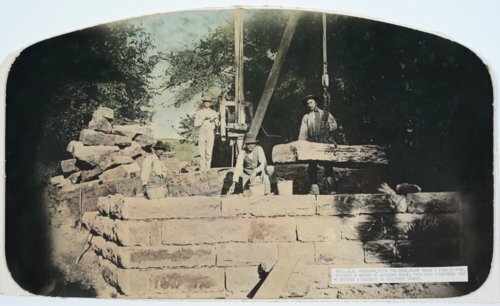 Photograph of four men building a bridge across Antelope Creek in Wabaunsee County, Kansas. The men are identified as A. E. Forinash, Clyde Forinash, Frank Weber, and Charlie Funk. They built more than 70 bridges and culverts in Wabaunsee County.